The son of an assistant school principal, he played baseball at Algonquin Regional High School in Northborough, Massachusetts, and at Worcester Academy, an elite day and boarding school in Central Massachusetts. In the 1974 amateur draft, he was not selected until the 10th round, when the Detroit Tigers picked him. In the minor leagues one of his coaches dubbed the lanky right-handed pitcher “The Bird” because of his resemblance to “Big Bird” of the Sesame Street television program. 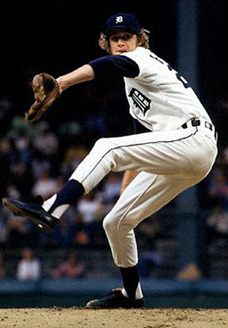 Fidrych made the Tigers as a non-roster invitee out of the 1976 spring training, not making his major-league debut until April 20, and not making his first start until mid-May. He only made that start because the scheduled starting pitcher had the flu. Fidrych responded by throwing seven no-hit innings, ending the game with a 2-1 victory in which he only gave up two hits. He went on to win a total of 19 games, led the league in ERA (2.34) and complete games (24), was the starting pitcher in that year’s All-Star Game, won the American League Rookie of the Year Award, and finished second in voting for the Cy Young Award. Fidrych lived with his wife Ann, whom he married in 1986, on a 107-acre (0.43 km2) farm in Northborough. They have a daughter, Jessica. Aside from fixing up his farmhouse, he worked as a contractor hauling gravel and asphalt in a ten-wheeler. Weekends he helped out at his mother-in-law’s business, Chet’s Diner in Northborough.